If you are in a hair rut, it's time to make some changes. 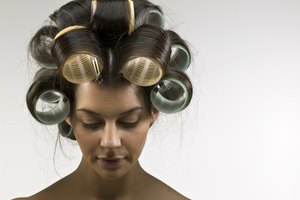 Those with natural curls may like the option of wearing their hair straight from time to time. The more options you have with hair, the better. Choose haircuts that can be worn curly or straight if you want to change up your look. The haircuts can be short or long. Take advantage of the versatility to create different styles each day. Shoulder-length hair can be worn curly or straight. It works for curly locks, as it is not too short, which can often cause curls to go crazy. Shoulder-length haircuts can be easily straightened for a smooth look. Add side bangs to the shoulder-length haircut. Long layers throughout the hair, with side-swept bangs, is modern and flattering. Avoid short bangs, as they don't work well for curly hair and would have to be straightened. A long bob haircut is a modified version of the classic bob. The long bob haircut reaches just to the middle of the neck. The classic bob is chin length and approximately the same length in the front and back. The long bob is a bit shorter in the back. It is easily worn curly by using mousse on the hair and scrunching it with your hands. Flat iron the hair to wear it straight. Long and layered haircuts weigh curls down enough so they are manageable. This style is easily straightened using a blow dryer and large, round brush. Have the hairstylist cut long layers throughout the hair. The layers in the front of the hair should start just above shoulder level. Run an anti-frizz serum over the hair to smooth flyaways. Pixie haircuts with hair left longer on top can work curly or straight. This haircut has extremely short sides and back. The top of the hair is longer, which maximizes natural curls. The hair sweeps over to one side. For a sleek, evening look, straighten the top of the hair using a flat iron. Swoop it over to the side and secure with a decorative clip.